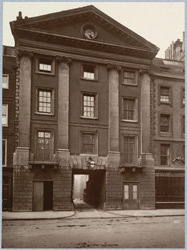 "The Gatehouse replaced by Wren's structure was erected by Sir Amias Paulet, who, before Wolsey came to be a great man, had put the future Cardinal in the stocks. Fourteen years later the Cardinal revenged himself by imprisoning Sir Amias in the Gatehouse of the Middle Temple, which he also made him rebuild. It is probably the circumstance which led to the name of 'Wolsey's Palace,' given to the other gate of the Temple."